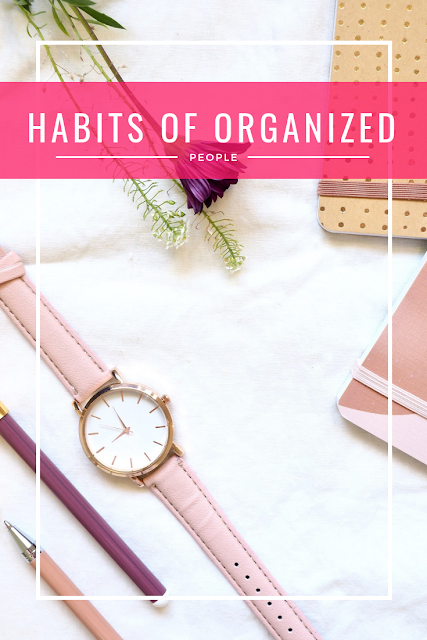 As a little bit of an expansion on yesterday's post, I have a few habits of organized people to share to help you if you're feeling like October is going to be your month to declutter and get on top of things. Like I mentioned, I think habits and actions are more important to becoming and staying organized, as opposed to buying the 'right' organizational and storage items. If you can master a few good habits, you'll see such huge improvement in your space and your mental clarity that you'll wonder why you ever bothered buying complicated organizational systems in the first place. Write things down. Your memory is never as good as you think it is, especially when you're busy. The minute you think that you need toilet paper or that you have to schedule a grooming for the dog or you have a genius blog post idea, write that down somewhere. Organized people don't forget things because they don't give themselves the opportunity to - they write things down right away, before a distraction pops up. Organized people also make and review to do lists at least daily. Things I own to help with this that are by no means necessary and you probably already have a version that works (see what I did there): notebooks and pens. Enter calendared appointments immediately. If you use an electronic one, pull the phone out right away and put an appointment or anything else you've committed to into the calendar immediately. If you use a paper planner, carry it with you and do the same. Like writing things down, you won't remember to enter it by the time you get home and then you're buying last minute cookies at the store because you forgot that you agreed to your kid's bake sale. If you're a chronically late person (people dislike you, you should know that), enter it for earlier than the scheduled time and hope that you'll forget you did that by the time the appointment comes around and you'll be there on time. Things I use: my planner and google calendar. Automate as much as possible. People have the impression that organized people are so on top of everything and how can they juggle so many balls? The key is, they're not. Organized people automate as much as possible to take things off their plate. They automate money moving to savings, they automate credit card payments and paying every bill that comes in, they get off paper statements and mailing lists to make mail time easier, even getting groceries delivered. It takes just a few minutes of work to set up these automatic things one time, and then you're done with that task for good. And you don't have to organize a filing system if you don't get any papers to file. Things I use: Chase bank to automate all the bills, Brandless and Boxed for deliveries. Use the two minute rule. It's simple - if the task can be done in under two minutes, just get it done instead of procrastinating. Things that can be done in two minutes? Taking the trash out, cleaning the microwave, emptying the dishwasher, making the bed, sorting the mail, taking the laundry to the washing machine and turning it on, wiping down the bathroom mirror and sink, etc. Organized people don't have a laundry list of 2 minute tasks to do at the end of every week, because they've been working on them as they come up. Things I use: the timer on my phone. It's like a game. Clean the kitchen counter. Often. Keep it bare. This applies to all surfaces, since clutter attracts clutter, but it's especially true in the kitchen because it's a noticeable, high traffic area. Organized people have clean kitchen counters not only because it looks nice and results in less mental stress, but also because the counters are then open for use. You can make dinner and meal prep for the week without having to deep clean first, and without having to move tons of appliances out of the way. The only thing on our counter tops are a coffee maker, our knife block, and the container with Hawkeye's treats. Things I use: cleaner and microfiber cloths. Change out of work clothes and do something with them. It's more comfortable, of course, but it also keeps the house clean and your work clothes looking nice. I always change when I get home and the dress I wore that day either gets hung back up if it's not dirty or it goes into the laundry. Things I use: velvet hangers. Keep laundry in a laundry basket. Not on the bed or on a chair or draped over a door, or, John's favorite, on the bathroom floor. If it's dirty, it goes in the laundry basket. When the basket is full, it goes in the washing machine (organized people have clean underwear.) Those are the only two options. And clean clothes always go where clean clothes should be, meaning that if you tried something on and didn't wear it, put it away properly. Things I use: an easy to carry laundry basket (tall ones get too heavy when full), plus a sorter that stays in the laundry room. Keep a space for small, daily (often misplaced) essentials. Like keys. I keep my keys in my purse and keep the purse on a table by the door, but John also takes his stuff out of his pockets and leaves them on that table too. No more time wasted looking for keys, and no more discovering John's debit card in the dryer because he left it in his shorts. Organized people don't make a mad dash around the house in the morning trying to remember what they need and collect things from various locations. They have everything waiting in one spot. Things I use: an Ikea table by the front door. And of course, organized people also do the other tasks on my list of simple homemaking habits. What habits keep you organized? What are you planning to work on soon?